I recently had the opportunity to talk to Gwynne Gorr, CEO at Squadron Mail Order. She's been on the job now for almost a year and has some interesting thoughts on trends, promoting the hobby, and a look into Squadron's product line. Scale Model Soup: Jerry Campbell, the founder of Squadron, passed away about a month ago. You’re now the CEO of the company he founded. What is his legacy in the hobby? Gwynne Gorr: I believe the greatest legacy Jerry left behind was making the tools of this hobby broadly available to everyone. From his first retail location in Detroit to our distribution facility in Carrollton, Texas, it is easy to see that he worked very hard making sure that every person who had an interest in modeling had access to not only interesting subjects to build, but the tools and accessories to make those builds the best they could be. SMS: Tell us about yourself. How did you come to join Squadron as CEO? GG: I spent a large part of my career leading the precision model business for The Franklin Mint, a role I truly loved. I learned a tremendous amount about what collectors look for in excellent models and bring that with me as I work with the team at MMD in the world of model building. The Franklin Mint was all about quality, integrity, and creativity. It is these key tenets that I am focused on now at MMD to help make it the greatest modeling company in the industry. SMS: When you look at your own sales and other industry information, what trends do you see within the scale modeling hobby today? There are lots of interesting things we see evolving from “the numbers” these days. While aviation subjects are still number one, there has been a pretty dramatic growth in armor subjects. This has been driven, I believe, by an improvement in the quality of these kits thus making them more interesting to build. Improvement in track design has also been a contributor. Availability of higher quality, more sophisticated kits is on the rise. Companies like Trumpeter, Kitty Hawk, and Panda have really been bringing up their game, and newer companies like Meng are adding pressure for excellence into the competition. All this is great news for modelers. The age of the average modeler continues to grow higher. The need to invigorate younger people to give the hobby a try is paramount to its health and well-being in the very near future. Everyone in this industry needs to do what it can to change this trend and grow the number of hobbyists. This is a focus of MMD and you will see a number of new categories of programs from us soon designed to attract new people to our hobby. SMS: How can Squadron, the manufacturers, and organizations like IPMS promote scale modeling? GG: I think there are lots of things that can be done. Get involved with organizations involving children to expose them to the hobby with programs like model building clubs, sponsoring activities with groups like Scouting, working with veterans groups communicating the benefits of modeling, and more editorial in broad based publications designed to show people how far the hobby has come since “the old days” to attract adult modelers that enjoyed the hobby as a child but have since abandoned it. This is a major focus of MMD, and hopefully of all the manufacturers and organizations in the industry. It represents the future lifeblood of our business and is of highest importance. SMS: Why are models so expensive, particularly those coming out of Asia? GG: There are two significant dynamics affecting the price of models these days. First of all, manufacturing numbers are down. There are many more models coming out than there used to be and many fewer modelers to purchase them. This leads to much smaller production quantities which in turn reduces economies of scale in manufacturing. This all adds up to higher cost. Add to that increasing labor rates in China coupled with higher raw material costs and it leads to higher pricing across the board. Additionally, the bar has been raised with regard to what the modeler expects. We want more detail, more parts, more interesting subjects, more photo etch, etc. These things all add up to higher cost as well. Again, if we had a larger base of builders, it would help to mitigate costs as costs could be spread out better across production. SMS: Some of my readers have asked about Squadron’s not carrying the latest Airfix kits. Will we see a re-stock? GG: I am happy to say that we should see Airfix back in our warehouse in late August or early September. SMS: Tell us more about Squadron's new lowest price guarantee. GG: It is our desire to build trust with our customers that we will bring them the best of everything in modeling. We have worked hard to increase the number of products we offer over the past several months. We have been very busy developing new tools and accessories such as the Squadron Plastic Weld to make the hobby enjoyable. We are implementing a new computer system to improve overall service to our customers. We are creating a vast library of videos, available on our website, to help modelers learn new tips and techniques to assist with their builds. In addition to all of this, we want our customers to know that they can count on us to be fair on price. If a customer can show us one of our kits is higher in price, we will match that price, period. We are committed to bringing the very best possible experience to anyone who buys from Squadron. Not only the best price, but the best service, the best resources, and the best selection as well. SMS: What is the biggest challenge facing Squadron? GG: I think the greatest challenge is making sure the merchandising reflects the desires of what the builders want to build. There are tens of thousands of modeling products out there and carrying them all would be impossible. Sorting through what is good, what is compelling, what is most interesting to the ultimate consumer is certainly not an easy thing! 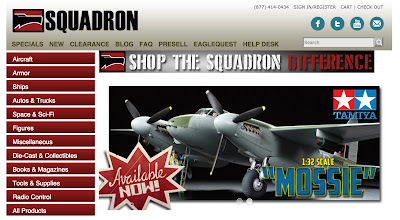 Our team at Squadron is built largely of modelers themselves, so you can imagine the intensity of debate as we evaluate new products as well as old ones to determine what and how many to buy. SMS: What can we look forward to in the latter half of 2015 and into 2016? There are lots of exciting things ahead from Squadron. We have two new Encore kits coming soon; one in August and one in November. The first two issues of these limited edition kits this year sold out in a matter of a couple of weeks, so we encourage customers to act quickly when the new ones are offered. They won’t last for long! We are working hard on building our video library of tips, techniques and reviews from Jef Verswyvel, our Chief Modeler. These videos are designed to help people improve their building skills and share the latest and greatest industry releases...all while having a little bit of fun at the same time. Be sure to tune check them out at Squadron.com. We are thrilled to announce that we will be going ahead with the 25th anniversary EagleQuest event in Dallas next summer. EagleQuest is a celebration of all that is model making; competition, camaraderie, and an opportunity to visit our warehouse operation are just a few reasons to attend. Watch for more information coming soon and we hope you can attend. Squadron is proud to also be a sponsor of Happy Joe, a veteran’s organization whose purpose is to help service men and women find employment in the digital world when their service to our nation is complete. We will have several new programs launched over the next year in support of their good work and spreading the word to others about this wonderful effort. Lots more top secret projects are underway as well. Stay tuned and keep modeling! SMS: Thank you for your time, Gwynne.